I don’t understand the Minneapolis Park Board at all. First, read this press release. 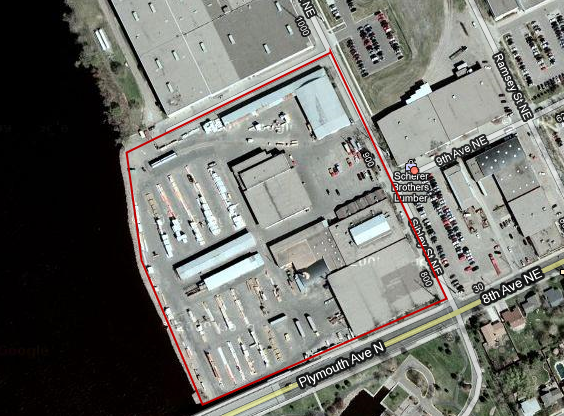 It describes how the Board has decided to spend $7.7 million on acquiring a former lumberyard on the Mississippi for conversion to a park. While I like the idea of expanding the park system, I found this to be a questionable use of funds because the Park Board, like nearly every other governmental entity in the state, has been operating under severe budget constraints for several years. Still, I was willing to give the Board the benefit of the doubt, and assume this really was too great an opportunity to pass up. I was along with my daughter’s fourth grade field trip, taking a riverboat tour of the river when I learned exactly where this $7.7 million expansion was located. So this acquisition provides a great new park along the river for Northeast Minneapolis, something which apparently lacking. Here’s a larger view, with the new acquisition outlined in red as before, but with the very large, and most significantly, riverside Boom Island Park, part of the Minneapolis Park System. 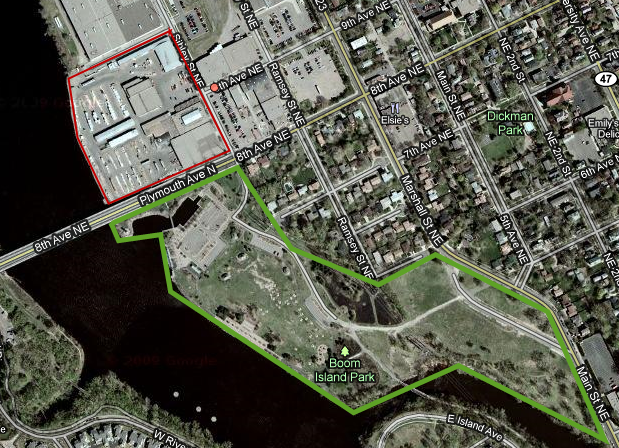 Note that Boom Island Park and the newly purchased parkland are quite literally right across the street from each other. Now supposedly there is a reason for this; it apparently fits in with the “Above the Falls Master Plan“, but given the disrepair in which much of the park system finds itself, that plan strikes me as more grandiose than visionary. I really wish the Park Board would get a grip on reality.